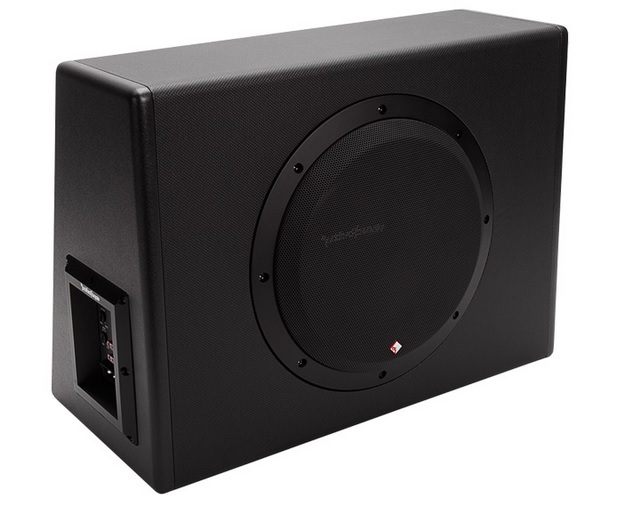 View cart “Rockford Fosgate P300-10 – 300W Single 10″ Amplified Subwoofer Enclosure” has been added to your cart. The Rockford Fosgate P300-10 is the perfect answer to boost the quality of sound on systems that might lack presence. It is also an excellent choice for customers who do not want the to install a separate amplifier and subwoofer. The company’s Punch products are the top sellers when it comes to amplifiers designed for use in cars and trucks. Customers know they can expect quality and simplicity from Rockford Fosgate, and the P300-10 is a perfect example of what makes Punch products stand out. It is a self-contained unit that comprises a 10ins subwoofer and built-in amplifier with an amazing 300-watt output. It is likely to be installed in the trunk, or behind or under a seat, so it comes with a durable MDF casing to withstand any accidental bumps or knocks when putting other stuff in the vehicle. The unit is quite heavy, weighing in at 13lbs. This makes it less likely to shift, but you will still want to bracket it somehow to stop it from moving around. To make the installation as easy as possible, the system has an automatic on/off function. It switches on automatically when it detects sounds coming through the system, and switches off when the sound stops. This saves having to install a separate on/off power switch. Connecting the P300-10 could not be easier. You only need to connect the positive lead to the battery, and the negative lead to an earth source, such as a bolt on the car or truck body. The unit comes with a convenient remote control. While this is very handy, you should obviously not try to use it while driving. For a reasonably priced, good quality, combined amp and subwoofer that produces great sound and is easy to install, the Rockford Fosgate P300-10 is hard to beat.